Farm Friends was a stand-up grazing event, organized by several BC wineries in response to the recent boycott on the importation of BC wine to Alberta. The day of the event, held at Edible Canada, the Alberta government dropped the ban so that the event became more of a celebration of BC wine and pairing with Alberta products, like beef and bison. Farmers, whether they are grape growers, grain farmers, or cattle producers, can be severely affected by the environment around them; and further restrictions placed by government agencies can further adversely affect farmers to a point where they could fail. A severe hailstorm at the wrong time in the growing season can wipe out a grape harvest, as it did in Burgundy, or flatten a grain crop so that it can no longer be harvested. An early spring frost can kill grape flowering. Too much rain in early fall can cause grapes to be diluted or burst, and for grain in the field to rot. The grain and grape farmer has only a short time span to grow their crops and harvest them, then wait through the winter for their next harvest. Nobody buys stocks in a single farmer so that the farmer can be prosperous. Farmers fund themselves going in debt to the bank. It is a hard life, but one they love. A hailstorm does not hurt the oilsands, wiping out a summer of work. Nor an early or late frost, or a heavy rainfall. Workers can extract oilsands 12 months of the year, not like the grain or grape farmer. Investors from around the world pour money into stocks supporting these companies extracting bitumen. As such, these companies have deep pockets to afford new equipment, to hire staff, and much more. Please support our farmers, in BC, Alberta, and across Canada. Buy their products and help them to provide quality products for your family. The Farm Friends event showed off our BC wine and Alberta produce. I hope that the synergy between our farmers across provinces continues to grow and be supported by the public, and by provincial and federal governments. Below are my tasting notes for five of the wines that were at the Farm Friends event that I tasted in advance. If these wines sound tasty to you, please go to your local government or private liquor store, or directly to the winery website, and purchase some of these wines. Enjoy. Dames White 2015 – A aromatic white blend, that showed primarily lemon and grapefruit rind aromas, along with some lime and apricot. It is dry with higher acidity, but still has some roundness to it. Quite flavourful, with flavours of citrus grapefruit, lime blossom and green fruit. It finishes with tart citrus and rind. A dry, zippy citrus wine to pair with goat cheese. This wine celebrates women’s contributions to the wine industry and benefits the Les Dames d’Escoffier BC‘s scholarship fund. Poplar Grove Pinot Gris 2017 – Made from 100% Pinot Gris grapes, fermented 100% in stainless steel. This wine has a very pretty nose, with aromas of peaches, white flowers, pine needles and honey. It is dry with medium acidity and body, but pronounced flavour intensity. The aromas carry to the palate, although the pine needles flavour is less intense. You can also add juicy tropical fruit and citrus flavours. There is some roundness to the wine. It has a medium plus length finishing with tart citrus and green fruit. This is excitement in the glass. Delicious. 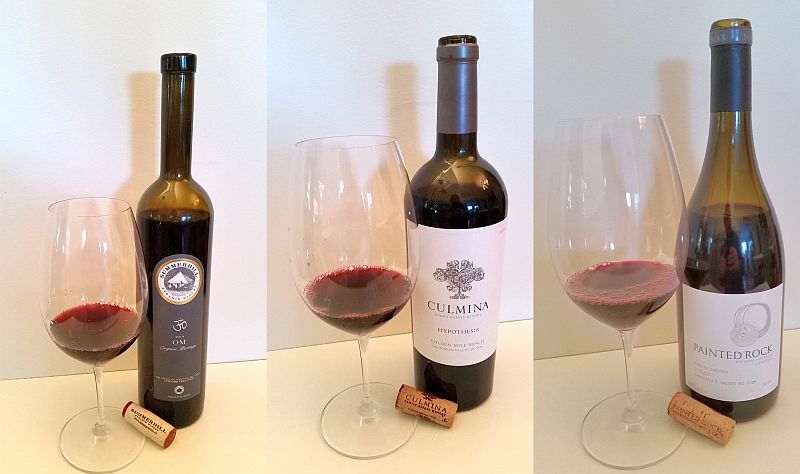 Culmina Hypothesis 2013 – A blend of blend of 38% Merlot, 36% Cabernet Franc, and 26% Cabernet Sauvignon, matured for 16 months in a combination of new (60%) and 1-year old (40%) French oak barrels. Opaque ruby in the glass. It has a medium intensity nose, quite pretty, with aromas of red cherries, raspberries and other red fruits, nutmeg, vanilla, chocolate and baby powder. It is dry, medium to full-bodied with a silky texture and tannic backbone. The tannins get stronger toward the finish, where they become quite grippy. You get a mix of black fruit, cassis and plum fruit flavours, as well as vanilla, nutmeg, oak and chocolate on the palate. The wine has a medium length, with grippy tannins, and tart black fruit flavours. This wine is built to age. It is already 5 years old, and can easily age another 5-10 years in my opinion. Quality. Painted Rock Syrah 2015 – The grapes are all estate grown and the wine was aged 18 months on and the oak of which 80% was French and 20% American. This wine is opaque ruby in colour. It has a medium plus intensity nose, showing pepper, black fruit, ripe black cherries, and touches of vanilla and nutmeg. With decanting, I also picked up some smoky bramble on the nose. The wine is dry, very silky with medium plus body and fine tannins. Deep, ripe rich flavours and a heavier mouthfeel. Black fruit, blackberries and ripe raspberries, along with vanilla, nutmeg and some oak flavours. With decanting there was also a hint of floral and chocolate. The wine has some pepperiness that picks up on the mid-palate and continues to the finish. The wine has a medium plus length finishing with tart black fruit, sweet spices, vanilla and pepperiness. The tannins are firmer on the finish, but not overpowering. A quality Syrah with ripe fruit flavours. It is very inviting and can be enjoyed with decanting or not. I as well have 3 BC Pinot Noirs that I will write about from Farm Friends, but will cover this in a separate article. 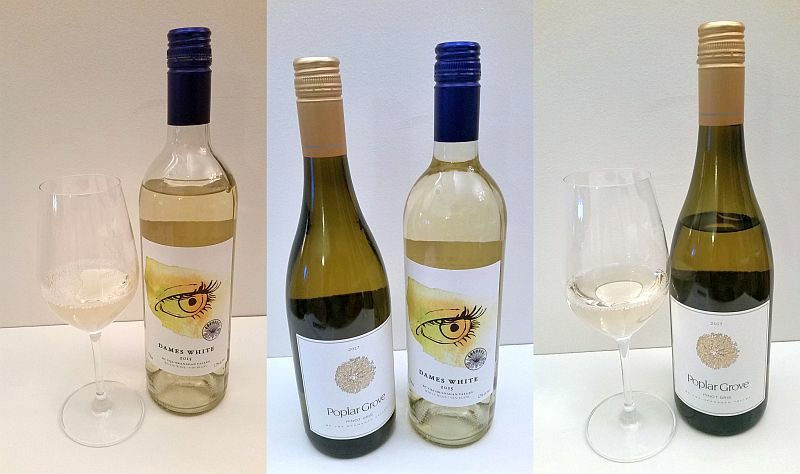 Some of these wines may also be purchased at your local BC Liquor store or private wine shop.